If you’re visiting this site, I suppose you’re at a place where (a) you want to learn about Japan because you’re planning to go there or already live there, or (b) you are fascinated by the country and somewhat feel like you have emotional connection to the culture. For those of you, Edo period would be one thing that would excite you about Japan. Edo culture has this very colorful lively character and diversity. What if you can be a samurai handing sward and a princess in elegant kimono with traditional hair do for a day? Or maybe a ninja if you’re more of an adventurous type. If you like the idea, then Edo Wonderland is the place to go. 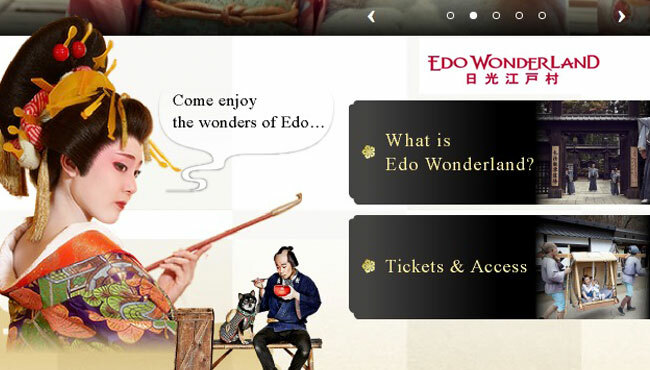 Edo Wonderland is cultural theme park that allows visitors to experience Edo period in full scale. All the buildings are traditional Japanese style and the whole park is landscaped accordingly. The restaurants serve traditionally accurate Japanese foods that were common during the time. They also have a service that lets you dress up in traditional costume while living Edo life. The place would be wonderful for people who enjoys activities that actually involves you to do things, not just walking around and eating. If you’re visiting as a couple, you two can maybe dress up as a pair and go on a date Edo style. Like going to a theater and eating soba noodle or going on a boat ride. If you’re going as a family, well, there are not much to say, but children will definitely love the role playing game. There are 4 restaurants in the park. They are pretty neutral, but it was exactly how Edo people ate. Soba used to be considered cuisine for rural areas. But it started to become more common for people during Edo period especially in city of Edo. Their most ordered dish is cold soba with kakiage (vegetable & seafood tempura). Ramen noodle place with a little bit of Chinese touch to the atmosphere. The reason is egg noodles were originally imported from China during Edo period, while a lot of people consider ramen noodle to be one of a Japanese staple food. If you want more than one-plate lunch, this place is for you. They have Japanese style set (soup, rice, main dish and a few extra dishes served on a tray) that is very tasty and health conscious. They would be the place for you if you’re more of a picky eater, since they have wider range of selections. Nice grilled skewers of meats and its smoky aroma will greet you as you approach this place. If you’re meat person, they have chicken, beef, pork or duck. Very good place to have a little snack to share with your group before heading back on the road. Because there is always a room left for a skewer or two. KidZania Edo way! Ninja is the most popular among children, but Okappiki Police is another recommendation. Okappiki was someone who unofficially worked for and with the police. They were very important part of Edo, since they often knew the place and city more. They usually were hired by police officers and played one of the most important part in maintaining public order. Samurai experience for adults. You get to learn how to handle sward and traditional Japanese spears. And cool thing is that you get to learn it from a person who works in films (‘Last Samurai’ to name one) teaching actors how to properly handle them. What you will learn is how they kept their spirit in a right place as a complete human being, too. Samurai considered themselves to be spiritual being and worked very hard on polishing it as well as working of their technique handling swards and spears. And interesting fact is, women in samurai family were considered the key role to run and protect the house and also learned how to handle swards alongside men. So ladies, do not hesitate to go on and try. People enjoyed peaceful time without wars in Edo and it let them explore more with technologies. It was no longer limited for the wealthy. Commoners started to improve the practicality and combined it with technology. You’ll be impressed how much of their knowledge is still used is our society. Going to the theater was one of favorite pastime for people of Edo. They have several selections to fit any tastes. Even if you do not understand Japanese language, there are shows you would still enjoy. ‘The Grand Ninja Theatre’ is one of them. They will show you ninja actions which is certain to boost your adrenaline. If you’re feeling more posh, try going to ‘Mizugei-za’ where they have wonderful illusion shows using water and the water magic show has more than 1,000 years of history. It would be something all family member of different generations can enjoy. If you want to touch the sense of Japanese beauty, ‘Oiran Courtesan Procession’ would be fantastic. It is also one of the most photogenic. One day pass is 4,700 yen for adult and 2,400 yen for children under 12. There is also afternoon pass available for 4,100 yen for adult and 2,100 for children. But be careful not to arrive too early. The afternoon pass only allows you to enter from 14:00 or 13:00 during winter season. The place is easily accessible from Tokyo by 2 hours train ride. *They also have special opening days on Wednesday throughout year and closing days for maintenance purpose. Please make sure to check their website before making a plan to visit the place. For those of you who’ll be staying in Japan for fairly long period of time and plan to fully explore broad area of the country by train, Japan Rail Pass might be something you’d find interesting. It is a pass for foreigner and Japanese who lives abroad and allows you to get on and off any trains run by JR without extra cost (unless you use express or Shinkansen) once you purchase the ticket once. Here Is The Place You Can Rent Kimono and Walk Around Asakusa! A Japanese sushi restaurant had a huge success, taking advantage of Big Data technology!